Despite no free trade agreement, Korea is Mexico’s sixth-largest trade partner, and the two economies had more than $15 billion of bilateral trade last year. That is about to get an even further boost when they enter into a free trade agreement and Seoul joins the Pacific Alliance of Chile, Colombia, Peru and Mexico as an associate member state, according to Mexico’s top envoy to Korea. “Last year was full of challenges, but also of unique opportunities. We have stood for the values that have given us strength -- supporting a rules-based international order, sustainable development and free trade. Many certainties have been shaken, but Korea and Mexico stand on the same side,” said Ambassador Bruno Figueroa Fischer on Friday at a reception in Seoul, which celebrated the 208th anniversary of Mexico’s independence. 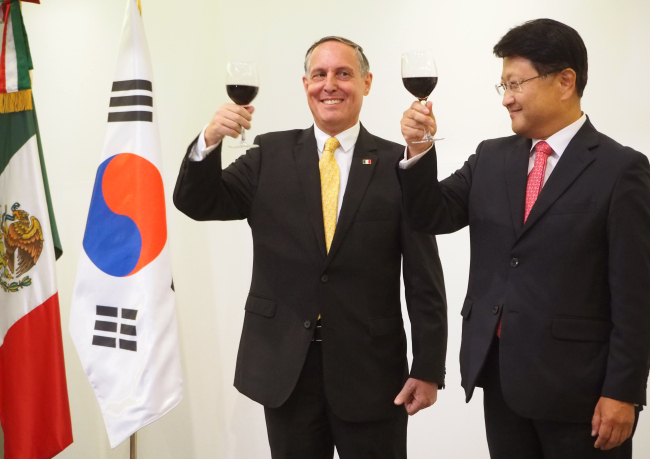 Last year, the two nations’ foreign and finance ministers held consultations, and an interparliamentary dialogue took place in January with the visit of President of the Mexican Senate Ernesto Cordero to Korea, according to the career diplomat. When two earthquakes shook Mexico’s central and southern regions last year, the Korean government, companies and civil society were among the first to offer aid in the form of millions of dollars, he said, thanking Korea for its quick and generous help. Korea’s 911 Private Search and Rescue Team Association, whose officers were present at the reception, flew to Mexico City to save lives under collapsed buildings, he highlighted. The embassy, working in partnership with local authorities, companies and a university, inaugurated the first Mexican Garden inside Suncheon Bay National Garden in South Jeolla Province in May. Since establishing diplomatic ties in 1962, Mexico and Korea have enhanced cooperation in diverse fields, and reached a strategic partnership in 2005, Korea’s first with a Central or South American country, said Korean Deputy Minister for Public Diplomacy Park Sahng-hoon. Park, also a career diplomat, said Mexico and Korea play important roles on the international stage as members of MIKTA, an informal alliance of middle powers Mexico, Indonesia, Korea, Turkey and Australia dedicated to improving international governance and solving regional and global challenges.